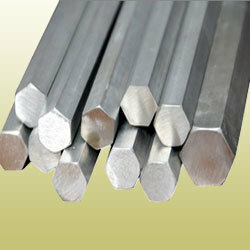 Manufacturer of a wide range of products which include monel hex bars. Our esteemed clients can avail from us a significant range ofMonel Hex Bars. Fabricated at our vendors' end, these offered bars stand tall on the parameters of the industry. Below cited are attributes owing to these bars are suitable for machining & forging applications. We offer these bars in two different grades such as Monel 400 (UNS No. N04400) and Monel 500 (UNS No. N05500). Furthermore, our valued clients can avail these products in form of pipes, tubes, fittings, flanges, sheet, plates, coils, rod and fasteners, in precut and in custom forged. Looking for Monel Hex Bars ?